I'm having the same issue here too. Malwarebytes not working Windows 10 Insider build 18323. Thank you everyone for the feedback. We are currently aware of this issue and are researching a fix. Microsoft has also been made aware of this issue. Thank you to everyone who has provided feedback on this issue. We're investigating the cause and will provide further details shortly. Please keep in mind that with this issue affecting a beta Operating System, issues are to be expected. In addition, a Process Monitor log would also be helpful. Please refer to the steps below. 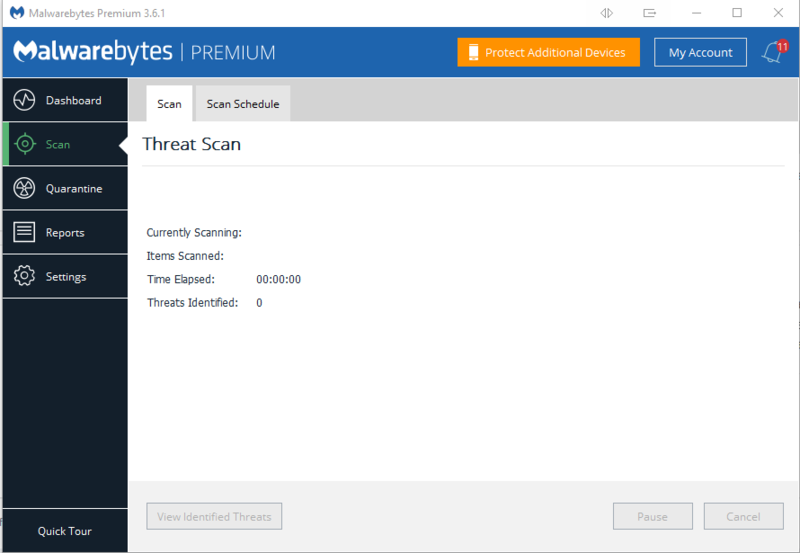 Quit Malwarebytes by right-clicking the Malwarebytes notification area icon (next to the clock) and clicking Quit Malwarebytes. Please download run_procmon.bat using the link below. Double-click run_procmon.bat. Click Yes if prompted by User Account Control. Note: If you are prompted by Windows SmartScreen, click More info followed by Run anyway. A black Command Prompt window will appear. Try to launch Malwarebytes and wait for the DDA Driver error. Don't click Yes to restart. Once done, click inside the Command Prompt window and press Y on your keyboard followed by Enter. Upon completion, a file named procmon-log.zip will be saved to your Desktop. Please attach the file in your next reply. Note: If the file is too large, you will be provided instructions to upload the file to a file hosting website (wetransfer.com). What email do you send the We Transfer to? If you have the ability to fall back to 18317, would you? Thank you for the mbst-grab. I did and it worked, but there were unrelated problems with that build. You don't need to send it to an email address. In WeTransfer click on the ... circular button and select Send as link and it should provide a URL for you to copy/paste when it's done. Just post that link in your reply here on the forums. Thanks for providing these. All this data should prove very helpful to the team troubleshooting the issue and will hopefully lead to a prompt resolution. I followed the instructions in post #31 above, but didn't get any notice about the DDA error. This has been the case with system reboots over the last few days, both on my desktop and my Surface Pro 4. Both systems are running Insider build 18323.1000. I get the message about protection being turned off on both systems. You can verify whether rootkit scanning is enabled or not by attempting to perform a Threat scan. Just open Malwarebytes and click Scan Now on the Dashboard and see if it is able to install the anti-rootkit driver and scan for rootkits (it should throw the DDA driver error if it isn't able to), and if it works you should see it performing the Scan for Rootkits portion of the scan near the beginning just after Pre-Scan Operations if you view the Scan tab while the scan is going. Rootkit scanning works a bit differently which is why I asked that you try a scan. The driver doesn't actually try to install itself when you turn the feature/switch on unlike the protection components as the rootkit scanning driver is only loaded when rootkit scanning is enabled and you attempt to run a scan. As long as you were able to scan and the scan log shows rootkit scanning was enabled and you saw that portion of the scan complete without any errors about the driver then it should be working. Hmm, when I try to run a scan on my desktop system, I get this more or less blank window. I rebooted the system after attempting a scan and getting this blank window, but the reboot hasn't changed the situation. A scan ran when I first logged onto the system this morning, and reported that no threats were detected. That was before I ran " run_procmon.bat "
Hmm, yeah, I suspect that is being caused by the driver not being able to load. In fact, if you open Malwarebytes and go to Settings>Application and enable the option under Event Log Data then replicate the issue once more by trying to run a scan again it should log what happened. Once that's done, go ahead and run the Malwarebytes Support Tool again and have it collect the logs then post the ZIP file. Once that's done, go ahead and disable the option under Event Log Data again that way it doesn't continue its verbose logging (those logs can get pretty big fast because it logs a LOT of stuff, so we only advise using it temporarily for support and troubleshooting). Attempting to run a scan still results in a blank window. A Hyper Scan appeared to run to completion, reporting no threats. But a Custom Scan (C: Drive only) resulted in this report. I strongly suspect the "Items Scanned" number is a carry over from the Hyper Scan. Thank you to everyone who has provided feedback and data on this issue. The feedback and data provided will help us confirm the nature of this issue and what steps are required to move forward.